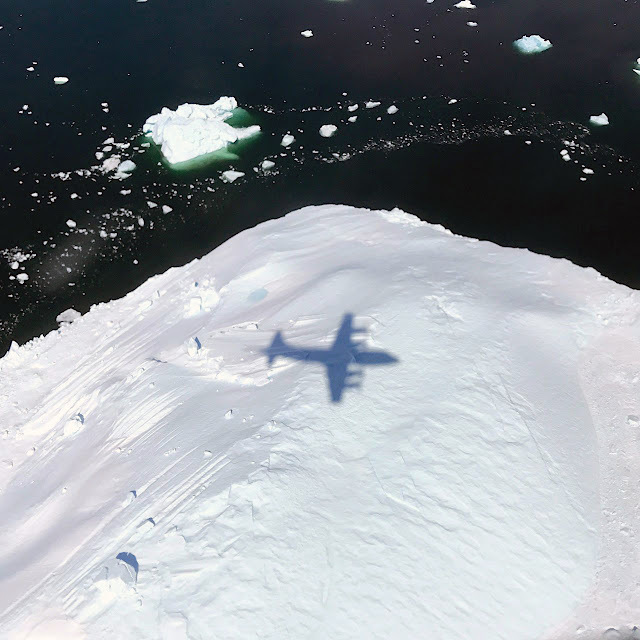 May 9, 2017: The shadow of NASA's P-3 aircraft is seen over an iceberg on a May 8, 2017 flight supporting NASA's Operation IceBridge mission. IceBridge began its final week of Arctic Spring 2017 surveys with a glacier-packed mission in Greenland, called Southeast Glaciers 01. The P-3 is a four-engine turboprop based out of Wallops and capable of long duration flights of 8-12 hours. It is supporting the same suite of IceBridge instruments flown in the past IceBridge Arctic and Antarctic campaigns. The mission of Operation IceBridge is to collect data on changing polar land and sea ice and maintain continuity of measurements between ICESat missions. The original ICESat mission ended in 2009, and its successor, ICESat-2, is scheduled for launch in 2018.